Lama Zopa Rinpoche at Istituto Lama Tzong Khapa, Pomaia, Italy, June 2008. Lama Zopa Rinpoche and His Holiness the Dalai Lama in Madison, USA; July 2008.
by rocks, first you have to recognize the blocks so that you can clear them away. “May all sentient beings have happiness and peace”. When you have suffering, problems, cancer, aids, relationship problem, whatever, think: “May all sentient beings’ oceans of samsaric sufferings be dried out”. The idea is to do tong-len practice from time to time each day. Especially when you do this practice of taking the sufferings you collect limitless skies of merit each time because you are taking the sufferings for numberless beings and purifying not only this life’s negative karma but also past life negative karma. So the stronger you generate compassion for animals or human beings, then many eons of negative karma get purified. And when you do the practice of giving you purify today’s, this life’s and past lives’ negative karma. It purifies many eons of negative karma. Lama Zopa Rinpoche travelled to Lawudo Retreat Centre high up in the mountains of Solu Khumbu in time to celebrate Saka Dawa on the 18th of June. This was the first time in nearly ten years that Rinpoche had visited Lawudo where the cave of Rinpoche’s previous incarnation, known as the Lawudo Lama, is situated. Although the monsoon rains had started this didn’t deter many local Sherpa people from making the long climb up to Lawudo to receive Rinpoche’s blessings. 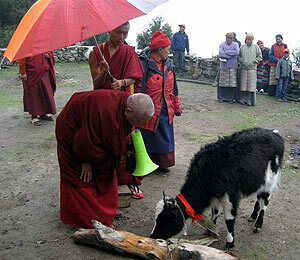 While in Lawudo, Rinpoche took the opportunity to bless many animals. 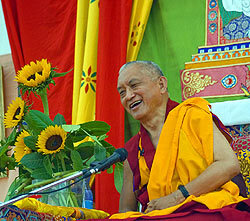 Lama Zopa Rinpoche in Italy, June 2008. This “little book of wisdom” is the most comprehensive, clear, concise, and accessible introduction to Rinpoche’s teachings yet. From loving-kindness all the way to emptiness, including guided meditations, How to Be Happy has it all. This slim volume will delight students and be the perfect gift to introduce Rinpoche to friends and family. FPMT Service trainings are moving forward. Regional trainer Allys Andrews is presenting a two-day abbreviated Foundation Service Training at the Australian National Meeting, as well as working with Ven. 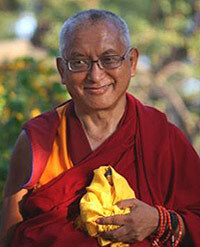 Chokyi to present a training at Vajrayana Institute, Australia. The North America Regional Meeting (Nov 22-24, Portland) will have a one-day Inner Job Description Training component led by training consultant, Amy Cayton. This training is an opportunity for centers to send a designated person to become their local trainer. Several trainings, including a Spiritual Program Coordinator Training, are tentatively scheduled for 2009 and 2010 and will be announced as soon as the dates and locations are confirmed. The Discovering Buddhism DVD has been produced in Russian using a voiceover rather than subtitles. We are hopeful this may be a faster way to get the DVD now into French, Italian, German, and Spanish! Coming Soon: Heart Advice for Death and Dying course for centers and homestudy. 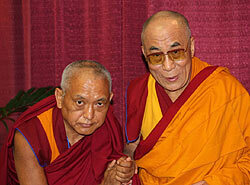 Rinpoche and Vens. 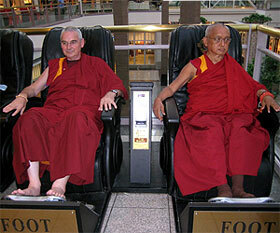 Roger, Sangpo, and Kunsang shopping for gifts and testing the massage chair in Chicago, July, 2008.
Who recently announced the success of their application for authority to offer graduate degrees in Buddhist Studies in the state of Oregon, USA. This approval means that Maitripa can now call itself a College, and that its program courses are available for college credit. This achievement is the first step towards regional accreditation. Opportunities include volunteering to help construct the new accommodation block at Atisha Centre in Australia and Tushita Meditation Centre in India is looking for a new director.